RBWO- that is the Four-Letter Alpha Code for red-bellied woodpecker. The Alpha Code list is developed by the American Ornithologists’ Union. It is based on the English (common) names of 2,078 birds. There is also a Six-Letter Alpha Code list based on the scientific names of the birds. So, for this bird, Melanerpes carolinus, the code is MELCAR. I am often asked why this bird is named red-bellied, when rarely does anyone see a red belly. As you can see in this photo, the so-called red belly is actually more of an orangey wash of color. It is definitely not easy to see if you are just casually observing the bird. This particular male also has a bit of color on his breast. Males have the red cap that extends to the beak, while females and immature birds only have red at the base of the neck and a tiny patch by the bill. This puffed up male was enjoying the fragments of black walnut meat stuck in the shells that the squirrels had discarded. I am so glad he could find a nice meal in my yard. One more thing to add to my “like” list about my black walnut tree. 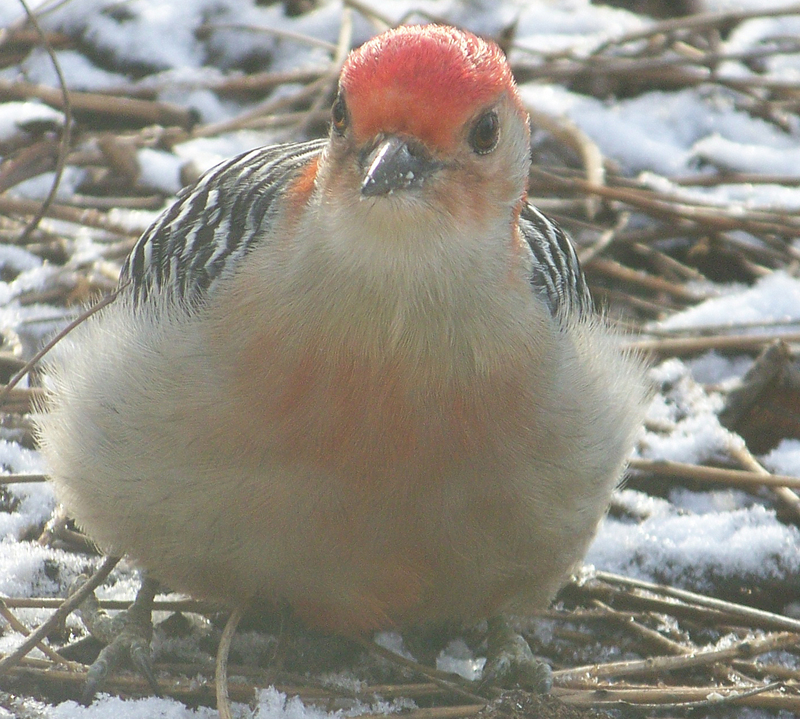 This entry was posted in Uncategorized and tagged black walnut, RBWO, red-bellied woodpecker on February 16, 2015 by elizabeth. Great info and woodpeckers are fascinating to watch.